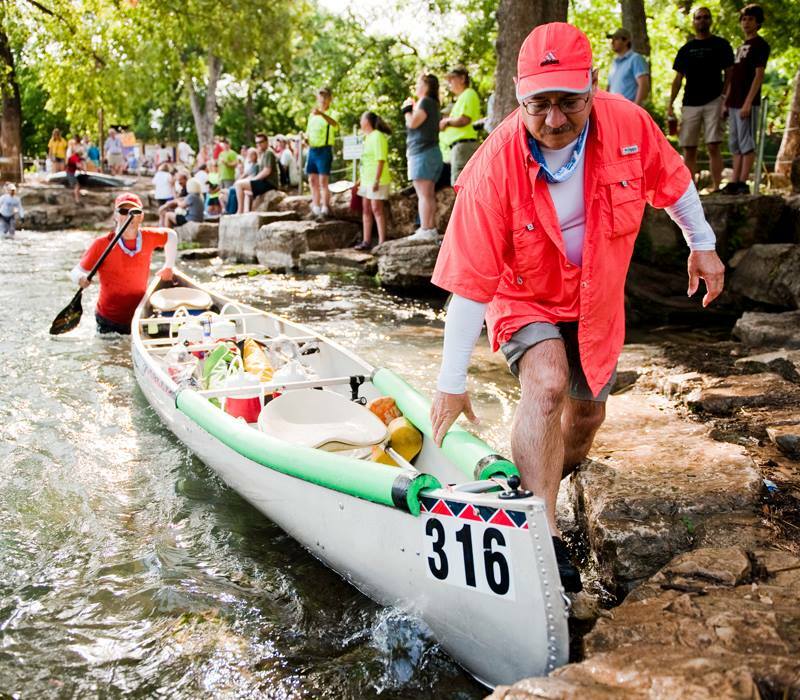 The 2013 Texas Water Safari ultra-marathon canoe race is now history. The contestants who competed in this grueling 260-mile race down two rivers and across five miles of open water have returned to their respective homes. I returned home yesterday — sunburned and more than a little tired and beat up. I have lots of aches, scrapes, and bites to remind me of the 89 hours I spent paddling a canoe with my friend Doyle. We finished 63rd out of 117 racers. 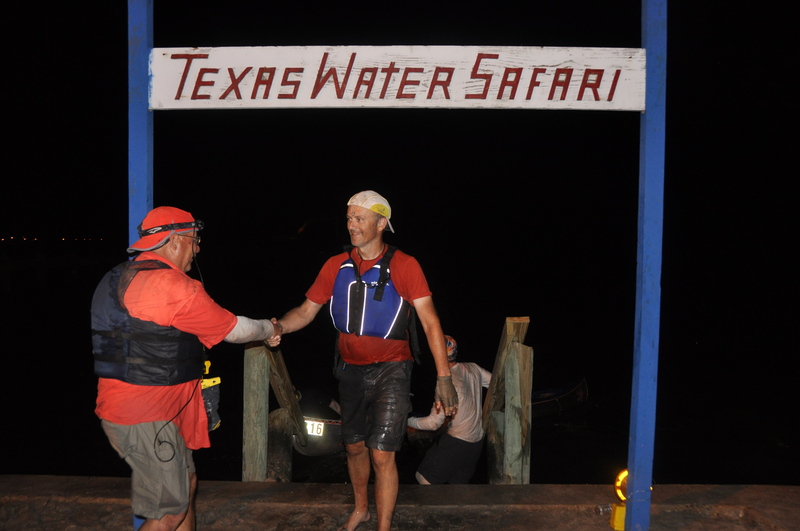 A few days before the race, I shared my top ten reasons for doing the Texas Water Safari. In reflecting on my second Safari finish, I have made a list of the top ten things I have learned from competing in this torturous race. Once again, and as I said in my previous post, I hope there is a lesson or two here that might encourage you on your own journey, whether on or off the river. 10. The right attitude can keep you afloat. 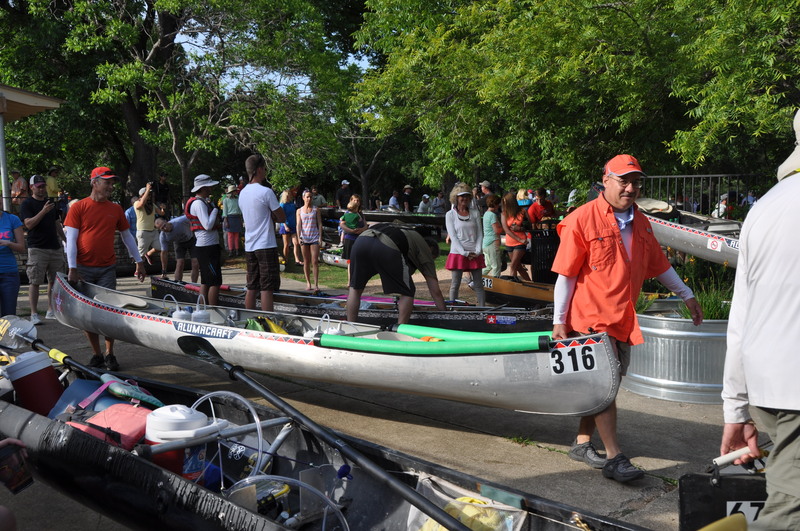 | Earlier this year, I wrote: “It’s not enough to be in decent shape to paddle the race course. It takes a 100% mental commitment to not give up, to paddle through the pain, and to persevere to the end.” The right mental attitude can keep you afloat, regardless of the outcome of the race. At the finish line after 89 hours and 28 minutes of paddling. 9. Sometimes you do things inelegantly. | Doyle and I spent many hours training on the more technical sections of the race course — sections with rapids, strong currents, portages, and more. When we did things inelegantly during the race, we simply reminded one another that we had made it through and then kept the main goal in sight. No whining and no looking back. Our less than graceful run of Cottonseed Rapids, but we made it through! 8. The unexpected will happen. | At two in the morning on our first full day on the river, Doyle and I got caught in a strong current that slammed us hard against a limb and dumped us out of the boat into deep water. It took us almost an hour to recover and find a missing paddle. We never found Doyle’s left shoe. Instead of whining about it, we talked about how we could make a shoe out of what we had in our dry bags. When the unexpected happens, you have to find creative solutions and paddle on. 7. Help others along the way. | I enjoy meeting other paddlers along the race course. 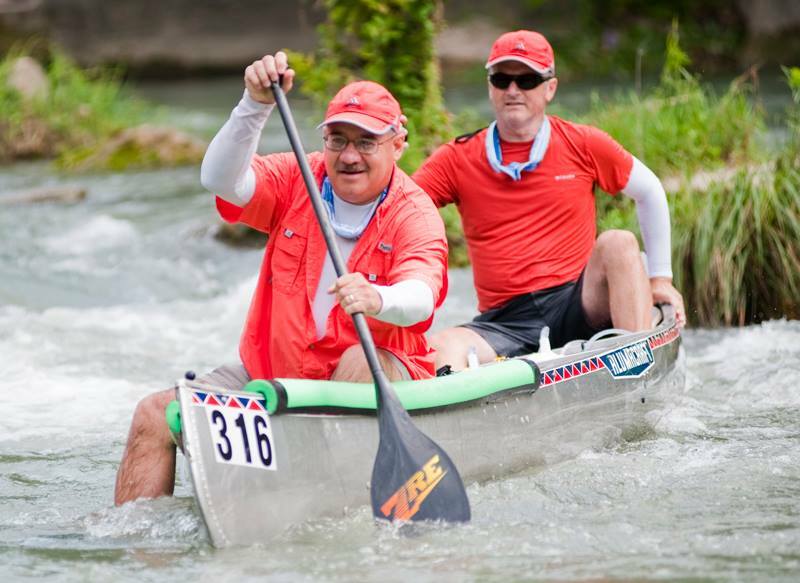 The conversations, especially for novice paddlers, tend to be about the race and what’s ahead. We met a few guys who had never portaged the log jam section of the river. Doyle and I agreed to show them the way through and made some new friends as a result. I’m glad we helped. I never want to lose sight of people along the way, even if it means I have to slow down in order to do so. Brian Stone, our fellow Kingsland pastor, praying for us at start and end of the race. 6. You can do more than you think is possible. | One thing the safari has taught me is that I can do more than I think is possible. I hit the proverbial wall several times along the course. However, each time I did I found reserves I never knew I had and was able to press on. Our bodies can indeed do more and take us farther than our minds think is possible. We got about 6 hours of sleep in four days. 5. A little rest can help you go a lot farther. | The book of Ecclesiastes cautions that if you never stop to sharpen your axe you will have to exert more energy to accomplish your task (Ecc. 10:10). The same is true on the Water Safari. If you don’t stop to rest occasionally, then you will get dull and possibly make some mistakes along the way that will cost you more time. So many family members and friends showed up to cheer on their respective teams. 4. Cheer for others. | I did not see as much of my son Jonathan as I had hoped. That’s because he and Bob, his team-mate, were hours ahead of us. I thought a lot about Jonathan and Bob, prayed for them, and cheered them on in my heart. I also enjoyed wishing others well along the way and congratulating them on their progress. And, Doyle and I appreciated all of the encouragement we received from our family and friends who came to cheer us on. Their presence and cheers energized us. Our training prepared us to know what to do at each portage. 3. Training is essential. | Doyle and I spent months preparing for the safari. We made numerous trips to train on the river. We also took lessons on how to improve our paddling and how to read the river. Although good training and hard work was no guarantee that we would make it to the finish line, it did prepare us for the challenge. With my good friend Doyle at the Luling 90 checkpoint. 2. Team up with a good partner. | I enjoyed doing this year’s safari with my friend Doyle. Although we have traveled the world together and have had some great adventures abroad, we both agree that traveling 260-miles down two Texas rivers is the hardest thing we have ever done. We watched out for each other, held one another accountable for our progress, and shared lots of conversation and laughter along the way. Our friendship made the journey more enjoyable. 1. Appreciate your team captain. | Doyle and I are deeply grateful for my daughter Niki who served as our team captain. This was Niki’s third time to serve as a team captain. She knows and does her job well. She handled countless details to meet us at each checkpoint to replenish our water supply, check on our nutrition, and monitor our health. She slept little, spent long hours waiting for us to arrive at each checkpoint, battled heat and mosquitos, and made certain that we stayed on schedule. We could not have reached the finish line without her help. So, these are my top ten take-aways from this year’s race. Will I do the race again next year? Well, it’s very likely. Doyle and I talked a lot about doing the race again in 2014. So, stay tuned. And thank you for following our adventure, for monitoring our progress on our SpotTracker page, for the thousands of views we received on our Lone Star Pastors Facebook page, and for the many encouraging comments that you left for us. So proud of y’all! I am thankful for the updates on Facebook and being able to pray for you and Doyle. Thanks for following our adventure, Sterling. Thanks also for your prayers. So happy and proud of you both, wish we could have seen more of you but knew Niki was taking good care of you! Congratulations! Thanks so much, Constance. We’re very proud of Ben for his great finish. Always good to see you and the family. Y’all did SO great!! Congrats again and great job to TC Niki as well!! Thank you, Aubrey. It was so good to see you and to meet your sisters. Thanks for taking such good care of Jonathan and Bob. Fantastic experience just watching the Lone Star Pastors! As I said during the race, what you did was incredible and hard. But, I also watch you guys doing your “day jobs” day after day, month after month, year after year. You guys are always selfless, serving others, leading by example, and telling others about Jesus. That’s the harder job. That is also the foundation that prepared you for the Texas Water Safari! Thanks for your kind words, Kay. It was a blessing to share this experience with Doyle and the Lowry family. Way to go D&O! It must have been a real adventure. Did you think about Lewis and Clark making the jouney up the Mississippi and to the start of the Missouri as you paddled along? You are like kindred spirits of theirs. You guys do really lead the way in Going Beyond. Glad you returned safe and enjoy the rest. Thanks, Gerry. We did have some conversations along the way about those who opened up new frontiers by venturing down uncharted rivers. Thanks to you and your ABF for following our adventure. Thanks, Clay. Will be sure to add you to our water well drilling trip to El Salvador. Always enjoy our time together on that trip. I’m just amazed at this fantastic feat you and Doyle accomplished. It was so much fun watching the tracking site and the FB posts Niki and Gina entered. The videos were priceless! Needless to say, to God be the Glory, and Phil. 4:13! 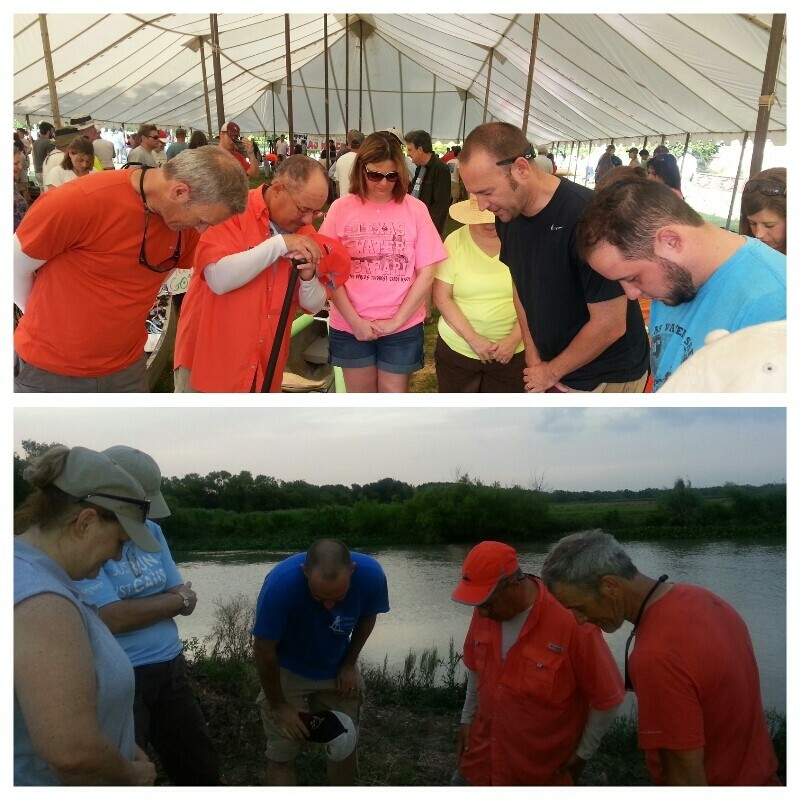 It was a blessing to pray for everyone’s safety that participated – on the river and off. Thanks for following our journey, Joyce. I thought about Phil. 4:13 more than once along the way. God indeed gave us strength to accomplish the task. Well done! An adventure you will never forget! Such a remarkable feat. I followed you with the spot tracker. That sure was a long way! Thanks for following our adventure, Steve. It was indeed a long and arduous journey. Glad to have it behind me. I wish we could’ve seen you more but I loved the videos! I’m so happy for you, Doyle, Bob, & Jonathan!!! It was an exciting adventure & I’m hooked on being a TC now. Great job guys! Thanks, Rena. Glad you got to experience the TWS. It is indeed both exciting and addicting. Great to see you there. Congratulations on your journey… Love your photos and life-lessons. I’m a bit surprised it was Doyle who lost his shoe when its you that had your foot hanging out of the boat through the rapids! Thanks, Craig. Actually I was pushing us off a submerged rock in the photo of us running Cottonseed Rapids. Doyle lost his shoe at a little after 2:00 AM the next day. After a brief nap, we got back in the canoe and shoved off from shore into a heavy mist obscuring our view of the river. That when we got slammed by a current we did not see into a tree limb we could not see. It was a bit terrifying until we got our wits about us and it cost us almost an extra hour. But, thank God we made it through. Thanks for following our adventure. Hope to see you again in Cambodia or perhaps down under one day. Congrats on so many levels. You, your family, your support team, all of us following you have been enriched. Thanks Omar!! Great job!! Thanks, Rae Ann. 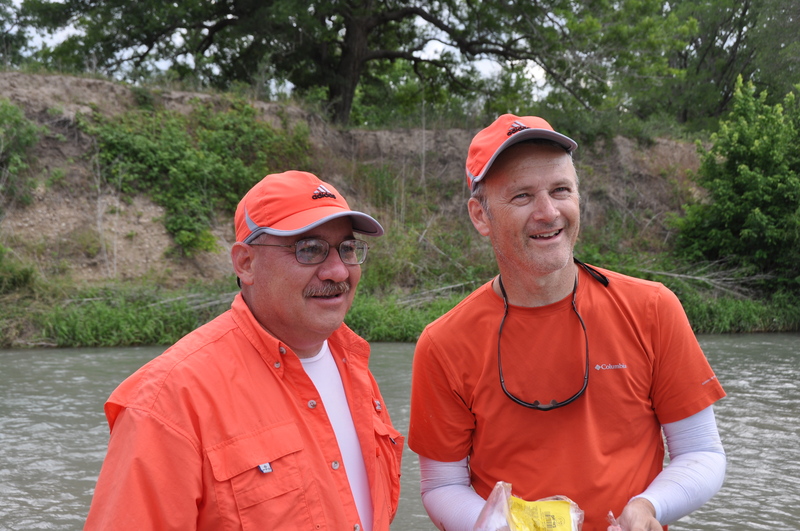 We appreciate you and Bill so much and are grateful that our paths intersected on Texas rivers. Thanks for your kindness and friendship. I got to paddle with your son and his partner, Bob. They were so enjoyable to run with as we paddled from Victoria through the log jams together. The 3rd night is always the scariest for me and it was comforting to have them to paddle with. Jonathan had really kind things to say about you and often wondered where you and Doyle might be at that moment. I had to laugh at Bob, who did not seem to be enjoying himself as much as Jonathan. I teased him about doing it a again next year and he made it abundantly clear that this was his last Safari, to which I just smiled and said, sure Bob, sure. Thanks for the blog. I have really enjoyed it. Hope to see you on the river! Thanks, Brenda. 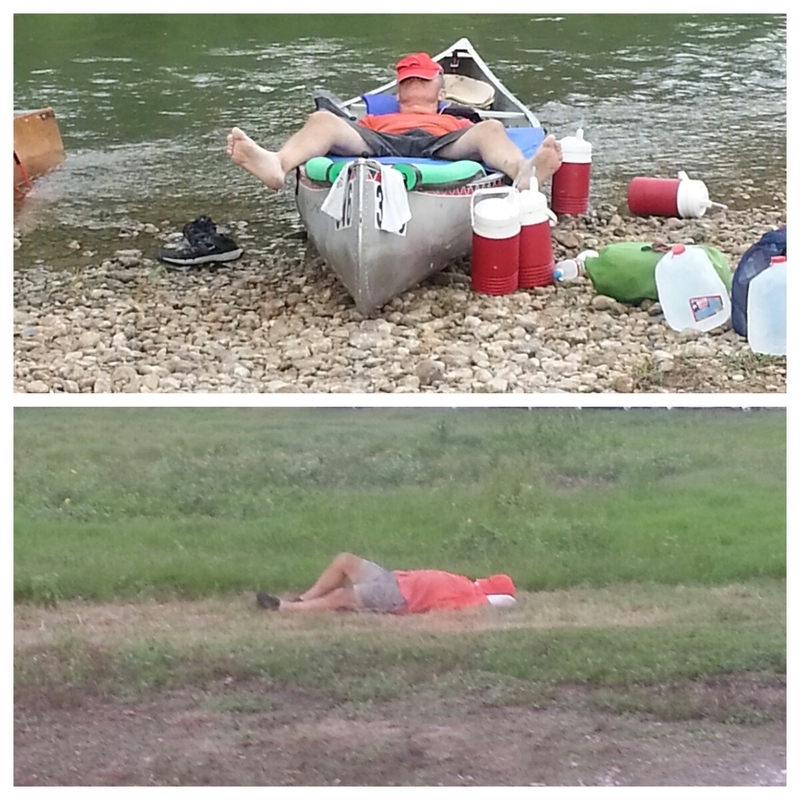 So glad that you and Jonathan and Bob were able to spend some time together on the river. It is always good to know there are others close by, especially through the log jam portages. Glad we all made it safely to the finish line. Look forward to seeing you sometime on a future race. This post got buried in my in box and I just found it! Congratulations to you Both! I loved following your progress and have learned much from all that you have shared of the experience. I hope you do it next year! Thanks, Chad. Hoping to do the race again next year. Hello Omar, I am doing the race for the first time this year. Wanted to ask you a few questions about it, what is the best way to get in touch with you? Glad to hear you will do the TWS. Drop me am email at omar@kingsland.org and let’s coordinate a time to chat on phone.